If you're looking for a high-performance front-wheel-drive sedan offering a number of unique styling and comfort features, you'll love the Maxima. My car is my favorite color. Blue. Low profile smooth. 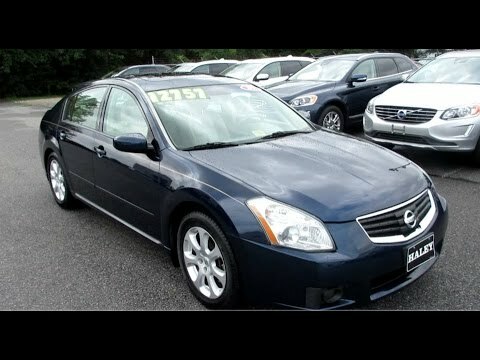 My Nissan maxima is a great car I enjoy the smooth ride. It was a gift from my mother, I appreciate it to the fullest. It started off really great ran good until I started taking it to a different dealer than mother use to go to slowly but surely it began to go down hill. It all ways have some type of problem engine, tires, brakes, dashboard lights come on and off while driving, took to dealer it never does it for them. It very expensive to maintain. Performance is o. K just expensive to keep up. Reliability sometimes worried about driving because not sure if it will continue going. Comfort is great. Feature are also great took awhile to get use to them. The car is very reliable, but has a turning radius problem. I drive a 2007 Nissan maxima and it has 150,000 miles. I have never really experienced problems with it and it has been very reliable. It has not broken down on me before (knock on wood) and it has not had any performance issues. It has a v6 in it and it gets about 22mpg which is fairly decent, but for a car I wish it was a little better. The a/c works very well and the heated seats and steering wheel come very in handy for the colder months. I have used it to travel and have taken it to Ohio from Alabama with no problems, so I would definitely recommend this car to others. Power. A maxima has variable transmission. My maxima has great performance. I get 17/miles per gallon, and it is very reliable. I have only had one problem with the vehicle. The power steering pump went bad. It is comfortable w/heated seats, fold in mirrors, the mirrors fold downward when you are backing up. Sunroof is pop-up, or fold back, heated steering wheel. I do find that my headlights stay on too long, and I do not know how to shorten the time; after cutting the car off. It has been and excellent car and it only has 101k miles on it. CERTAIN PASSENGER VEHICLES EQUIPPED WITH AN 'INTELLIGENT KEY' FAIL TO CONFORM TO THE REQUIREMENTS OF FEDERAL MOTOR VEHICLE SAFETY STANDARD NO. 114, 'THEFT PROTECTION.' DURING AN INSPECTION OF SOME VEHICLES AT THE ASSEMBLY PLANT, IT WAS FOUND THAT THE STEERING WHEEL WAS LOCKED WITH THE IGNITION KNOB IN THE 'OFF' POSITION BUT THE VEHICLE TRANSMISSION NOT BEING IN THE 'PARK' POSITION. IF THE KEY IS TURNED TO THE "OFF" POSITION WITHOUT THE TRANSMISSION BEING IN THE "PARK" POSITION, IT IS POSSIBLE THAT THE STEERING WHEEL CAN LOCK WHEN TURNED TO THE RIGHT.